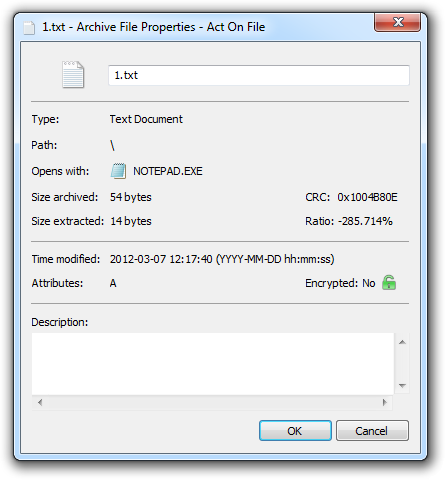 Act On File 2012 - The Compressor Module - The Open Archive Functionality Open Archive - Easily Maintain Archives: Browse, Edit, Modify, Extract, Export, Play and Perform Many Operations On an Archive. Open Archive - Maintain Archives: Browse, Edit, Modify, Extract, Export, Play and Perform Many Operations On Archives. This section discusses the Open Archive functionality of the Compressor module. The Open Archive functionality is a full-scale archive viewer and editor. 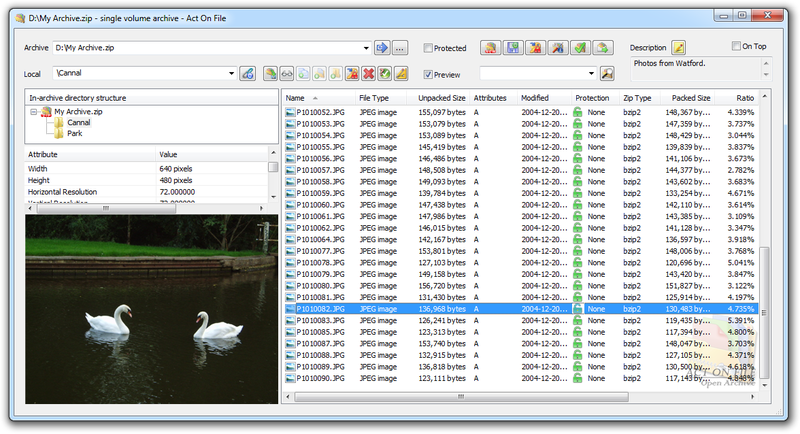 It is able to perform most, if not all, possible actions to an archive, including: repair archives with a bad internal structure, add, move, rename, and delete files and folders from the archive, edit and update files and folders, encrypt files in the archive, add comments to individual files, folders and to the archive as a whole, export branches and extract parts from the archive or decompress the entire archive, etc operations. The Open Archive editor has a built-in preview window in which one can see the content of the currently selected file or folder. It also has a built-in music and video player so the user can have all their music and videos compressed into one large archive and play them from within it. The Open Archive functionality is perhaps the most user-friendly and flexible archive editor currently available. Open the archive using the Open Archive viewer and editor. Use the available functions through the buttons and context menus. The Open Archive viewer and editor has two panes, left and right, organized in a traditional manner. The left pane is the archive and its folders view, and the right pane is to display the files and folders located in the selected item in the left pane. There is always a selection either in the right or in the left pane, which is important when invoking a button as the buttons always apply their action on the selected item. In addition, when the "Preview" checkbox is selected, the lower part of the left pane becomes a preview window where the content of the selected item is either suitably displayed or shown as data when it cannot be interpreted by the module. The module also allows the user to view and edit files from within the archive. Through the easily-accessible find controls, the very powerful search engine of the the Act On File Locator module can be accessed, enabling the user to search for all possible data in the archive. These controls are used to control the archive as a whole and for other generic operations. Archive Enter the path and the archive name. You can use the browse button, drag and drop, paste and type to enter the filename. Click the Open & Reload button if required. Click this button to load or reload the archive with the filename entered to the left. Click this button to open a Browse for Archive Dialog, which will be loaded after being selected. Protected Typically, if the software is interrupted while modifying the archive, e.g. due to a power failure, the entire archive becomes unusable. Set this checkbox to request the module to work with a pair of temporary and official archives in order to make the loss of data for this reason impossible. Clear this checkbox to work directly with the archive assuming any associated risks. Working in protected mode is slower than normal operation due to the required duplication of the original archive. It also requires additional space. Click this button to invoke the Create New Archive dialog. Show/Hide help for the Create New Archive dialog. Create New Archive With Open Archive Window Select this option to create the new archive using the Open Archive functionality. This option allows you to create an empty archive and have it ready to edit as soon as you create it. Open the New Archive in a New Open Archive Window Set this checkbox to have the new archive opened with a new Open Archive functionality window. This allows you to have the two archives opened simultaneously with two Open Archive windows. 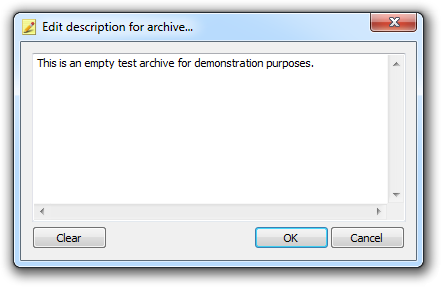 Clear this checkbox to close the currently opened archive and create the new archive using this Open Archive window. Create New Archive With Compress Files Window Select this option to create the new archive using the Compress Files functionality window. The new archive will not be created until the files to be compressed are selected and the Compress Files functionality is requested to proceed creating the new archive. Close This Open Archive Window Set this checkbox to have the Open Archive functionality window automatically closed as the Compress Files functionality is launched. Clear this checkbox to keep this Open Archive window open. Hide the help for the Create New Archive dialog. Click this button to invoke the Save As archive dialog. Show/Hide help for the Save As [Archive] dialog. New Archive Enter or browse for the name and location of the "save as" archive. Save As - Archive Type Select the disposition and packaging type of the new archive. Spanned Archive The new archive must be saved on a removable media device. This option causes the archive to be split into parts, filling up the available space on the current media in the selected drive, i.e. spanning on the removable media. Split Archive The new archive will consist of multiple parts of the requested size. 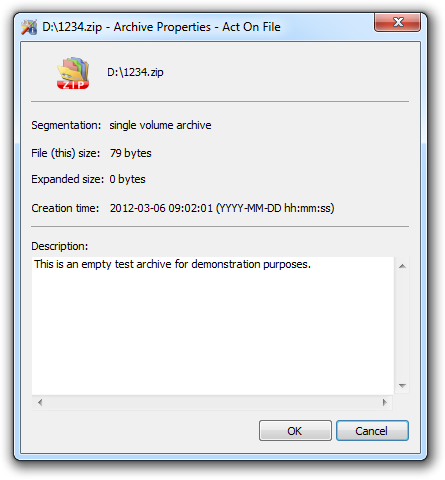 1.44 MB - floppy Creates an archive split into parts with a size of 1.44 MB. The last part of the archive may be smaller. 650 MB - CD Creates an archive split into parts with a size of 650 MB each. The last part of the archive may be smaller. 700 MB - CD Creates an archive split into parts with a size of 700 MB each. The last part of the archive may be smaller. 4.7 GB - DVD Creates an archive split into parts with a size of 4.7 GB each. The last part of the archive may be smaller. 8.5 GB - DVD Creates an archive split into parts with a size of 8.5 GB each. The last part of the archive may be smaller. Custom Size Creates an archive split into parts with a size entered by the user (minimum is 65,535 bytes). The last part of the archive may be smaller. Single Volume Archive Creates an archive which is a single file. There are no restrictions on the file size up to 2^64 bytes (over 18 quintillion bytes). Self-extractor Archive Creates a single file archive as above, but will be packaged as an executable file; allowing the archive to self-decompress on machines without any suitable archiving software. Change Compression Algorithm Select the compression type for the new archive. Recompress All Files Using Algorithm Type Set this checkbox to recompress the files of the archive as they are transferred into the newly created archive using the selected algorithm. Clear this flag to transfer the data into the converted achieves as it is. If this flag is set, any encrypted file will first need to be decrypted in order to be recompressed. In this case, the password(s) for decryption will be requested at the time of decompression (and decryption) of the respective file. To encrypt the data in the new archive, use the encryption option below or the Open Archive functionality as a separate action afterwards. zip This is the standard deflate (zip compatible) algorithm. bzip2 This is the bzip2 algorithm. store This algorithm stores the data with no compression. This option is suitable for already compressed, random or pseudorandom data which cannot be compressed efficiently. [best] This method tries all other methods and uses the best compression for each particular file. Encryption Use these controls to remove or set encryption on the data in the new archive. 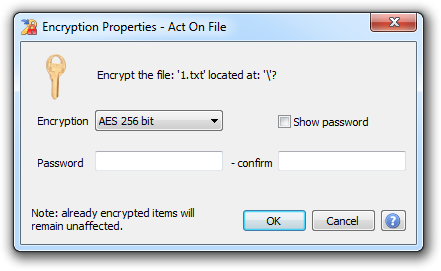 Remove any existing encryption from transferred files Set this checkbox to transfer any encrypted data in a decrypted form. Clear this flag to copy the data as it is. Note that when recompressing an archive, this flag will automatically be set due to the nature of recompression. Encrypt non-encrypted files when transferring them to new archive Set this checkbox to add non-encrypted data to the new archive in an encrypted form. Encrypted files in archives cannot be encrypted again. Thus, when transferring data from the source to the destination archive without recompressing the data, this option only applies to the non-encrypted files. Conversely, when recompressing the data, this option applies to all files as they must always be decrypted before being recompressed. Clear this option if you do not with to apply encryption to the files as they are added to a converted archive. None Add the files without any encryption. Basic Zip Encrypt the files to be added to the archive with a basic zip encryption algorithm. AES 128 bit Encrypt the files to be added to the archive with a 128 bit key AES (Advanced Encryption Standard aka Rijndael) encryption algorithm. AES 192 bit Encrypt the files to be added to the archive with a 192 bit key AES (Advanced Encryption Standard aka Rijndael) encryption algorithm. 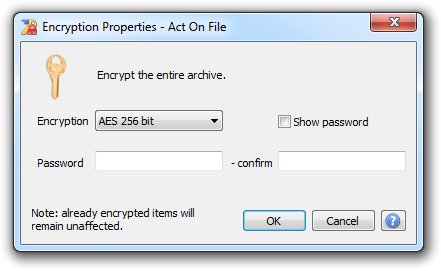 AES 256 bit Encrypt the files to be added to the archive with a 256 bit key AES (Advanced Encryption Standard aka Rijndael) encryption algorithm. Password Enter the password you want to use to encrypt the data. Confirm [Password] Enter the password again to confirm it. Show Password Toggle this checkbox to make the password readable or not. Enter a description for the new archive or leave the field empty to create the new archive without an embedded description. Send Email Set this checkbox to request the module to start the default e-mail software installed on the machine and attach the new archive to a new e-mail message. Open The New Archive (New Window) Set this checkbox if you want to open the newly-created archive when it is created. If not, clear this checkbox. Save As Proceed with creating the new archive using the selected properties. Cancel Close the dialog without any effect taking place.
? (Help) Open the help file and load this article. has at least 2 non alphanumeric characters (@, +, !, etc.). Additionally, it must not contain sequential strings (e.g. "ABC...", "345..", "qwert...", "ZYX...", etc.) and obvious character substitutions (e.g. replacing "i" with "1"). Hide the help for the Save As [Archive] dialog. Click this button to encrypt the entire archive. Only non-encrypted files will be affected. Note: split and spanned archives cannot be modified. Show/Hide help for the Encrypt Archive dialog. Encryption Select the required encryption type. Note that already encrypted data will remain unaffected. Password Enter the password to encrypt the data with. OK Proceed encrypting all unencrypted items in the archive. Hide the help for the Encrypt Archive dialog. Click this button to invoke the Archive Properties dialog. Show/Hide help for the Archive Properties dialog. View or edit the archive description (when possible). OK Close the dialog and save any changes made to the archive description. Cancel Close the dialog without saving any changes. Hide the help for the Archive Properties dialog. Click this button to test the entire archive for consistency. Click this button to invoke the default mail client on this machine and attach the archive to a new e-mail message. Click this button to open the Edit Archive Description dialog. This window is only functional for single volume archives. Show/Hide help for the Open and Edit Archive Description dialog. Description [window] View or edit the archive description. Hide the help for the Open and Edit Archive Description dialog. These controls are used to control the currently selected section of the archive. Note that when the currently selected item in the left pane is the archive itself, the controls apply to the whole archive. Local View the archive path to the currently selected folder, or select or enter a new current location. Use the Synchronize View button or hit Enter to navigate to the desired location. Click this button to synchronize the right pane view with the entered location in the archive. Click this button to decompress the selected items into a folder of your choice. The directory structure of the decompressed items is preserved as it is in the archive. Click this button to open the selected files using the default application for each particular file-type. This function is only available for files. The viewed files are decompressed in a temporary folder for the process of viewing and are deleted afterwards. Click this button to add files to the archive at the currently selected location. Note: split and spanned archives cannot be modified. Show/Hide help for the Add Files dialog. Algorithm Select the algorithm to be used to compress the data. Mode Choose the archiving management mode. Add Only Only the files in the selection which are not already in the archive will be added to it. This option is only applicable to single volume archives. Add & Replace All selected files will be added to the archive. If a file is already in the archive then it will be deleted and the newly selected file will be added in its place. This option is only applicable to single volume archives. Add & Freshen All selected files will be added to the archive. If a file is already in the archive then it will be deleted but its comment will be preserved and associated with the file that replaces it. This option is only applicable to single volume archives. Add & Choose The files in the selection which are not already in the archive will be added unconditionally. The files which are already in the archive will cause Act On File to issue a question dialog asking how to proceed with the particular file. The question dialog will be displayed for each conflicting file unless the "Apply to all" checkbox is selected. This option is only applicable to single volume archives. Replace Only Only the files that already exist in the archive will be replaced with the newly selected files. The comments of the replaced files will be lost. Selected files which are not already in the archive will be ignored. This option is only applicable to single volume archives. Freshen Only Only the files that already exist in the archive will be replaced with the newly selected files. Any comments of a replaced file will be kept and associated with the file that replaces it. Selected files which are not already in the archive will be ignored. This option is only applicable to single volume archives. Shortcuts Not Applicable - shortcuts are always dereferenced. Include Files/Folders Select the features of the required behavior. Hidden When this checkbox is clear, the module will ignore hidden files and will not add them to the archive. Set this checkbox to alternate this behavior. System When this checkbox is clear, the module will ignore system files and will not add them to the archive. Set this checkbox to alternate this behavior. Only Archived Attributed Set this checkbox to ignore files which have their archived attribute cleared. Clear this checkbox to alternate this behavior. Reset Archive Attribute Set this checkbox to request the module to clear the archived attribute of any file added to the archive. Clear this checkbox to alternate this behavior. Empty Files When this checkbox is clear, the module will not add empty files to the archive. Set this checkbox to alternate this behavior. Encryption Select the required encryption type. Append Description To The Selected Items Enter a description or comment for the selected files. The text will be associated with each added file. Delete Source Items Set this checkbox to request from module to send the archived files to the Recycle Bin after a successful compression. Confirm Delete [Source Items] Set this checkbox to confirm the request to delete the source files after a successful compression process. OK Proceed with compressing the files. Cancel Close the dialog without adding the files. Hide the help for the Add Files dialog. Click this button to select a folder (from the file system) and add it to the archive at the currently selected location. The window which appears when adding a folder is the same as the one that appears when drag and dropping files and folders from Windows Explorer or pasting them from the clipboard. Note: split and spanned archives cannot be modified. Show/Hide help for the Add Folder dialog. Add Only Only the items in the selection which are not already in the archive will be added to it. This option is only applicable to single volume archives. Add & Replace All selected items will be added to the archive. If an item is already in the archive then it will be deleted and the newly selected item will be added in its place. Note that for folders, this means that the content of the original will be deleted and replaced with the content of the newly selected folder. This option is only applicable to single volume archives. Add & Freshen All selected items will be added to the archive. If an item is already in the archive then it will be deleted but its comment will be preserved and associated with the item that replaces it. Note that for folders, this means that the content of the original will be deleted and replaced with the content of the newly selected folder. This option is only applicable to single volume archives. Add & Choose The items in the selection which are not already in the archive will be added unconditionally. The items which are already in the archive will cause Act On File to issue a question dialog asking how to proceed with the particular item (files or folder). The question dialog will be displayed for each conflicting item unless the "Apply to all" checkbox is selected. This option is only applicable to single volume archives. Replace Only Only the items that already exist in the archive will be replaced with the newly selected items. Note that for folders, this means that the content of the original will be deleted and replaced with the content of the newly selected folder. The comments of the replaced items will be lost. Selected items which are not already in the archive will be ignored. This option is only applicable to single volume archives. Freshen Only Only the items that already exist in the archive will be replaced with the newly selected items. Note that for folders, this means that the content of the original will be deleted and replaced with the content of the newly selected folder. Any comments of a replaced item will be kept and associated with the item that replaces it. Selected items which are not already in the archive will be ignored. This option is only applicable to single volume archives. Shortcuts Select the required behavior in respect to any contained shortcuts. Hidden When this checkbox is clear, the module will ignore hidden files and folders and will not add them to the archive. Set this checkbox to alternate this behavior. System When this checkbox is clear, the module will ignore system files and folders and will not add them to the archive. Set this checkbox to alternate this behavior. Only Archived Attributed Set this checkbox to ignore files and folders which have their archived attribute cleared. Clear this checkbox to alternate this behavior. Reset Archive Attribute Set this checkbox to request the module to clear the archived attribute of any file and folder added to the archive. Clear this checkbox to alternate this behavior. Empty Folders When this checkbox is clear, the module will not add empty folders to the archive. An empty folder is a folder without any data in it. Note, a folder containing empty files or subfolders is considered empty. Append Description To The Selected Items Enter a description or comment for the selected folder and its content. The text will be associated with each added file and folder. Delete Source Items Set this checkbox to request the module to send the archived items to the Recycle Bin after successful compression. Confirm Delete [Source Items] Set this checkbox to confirm the request to delete the source items after a successful compression process. OK Proceed with compressing the selected folder. Cancel Close the dialog without adding the folder. Hide the help for the Add Folder dialog. 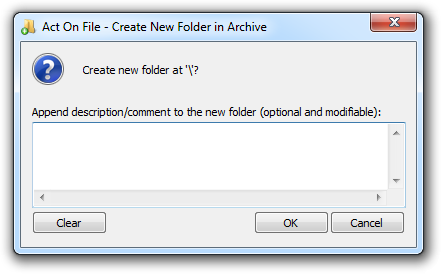 Click this button to open the Create New Folder dialog where you can enter a description for the new folder. Note: split and spanned archives cannot be modified. Show/Hide help for the Create New Folder dialog. Description/Comment [window] Enter a description or comment for the new folder which will be created. 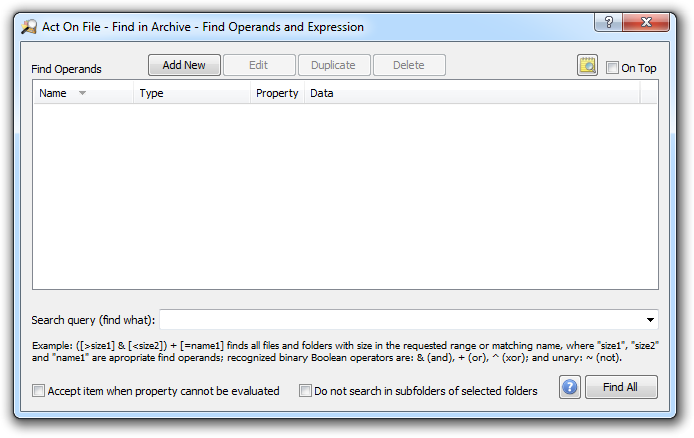 The folder description can be changed at any time using the folder properties dialog. Clear Remove any text entered in the description textbox. OK Proceed with creating the new folder. The folder name is entered in-place after the folder is created. Hide the help for the Create New Folder dialog. Click this button to encrypt the selected items. Only currently non-encrypted files will be affected. Note: split and spanned archives cannot be modified. Show/Hide help for the Encrypt Selection dialog. Hide the help for the Encrypt Selection dialog. Click this button to delete the selected items. A confirmation window will be displayed. Note: split and spanned archives cannot be modified. Click this button to test the consistency of the selected items within the archive. Click this button to display the properties of the selected item or the common properties of the selected items, when more than one item is selected. Show/Hide help for the Selection Properties dialog. [Name Textbox] Use this textbox to rename the selected file or folder. This field cannot be used to edit multiple files simultaneously. Description/Comment [window] Enter or edit the description or comment for the selected file or folder. This field cannot be used to edit multiple files simultaneously. OK Proceed with closing the property dialog and updating any modified property. Hide the help for the Selection Properties dialog. Preview The Preview checkbox controls the appearance of a viewer of the selected items located in the bottom part of the left view pane. The top part of the previewer contains information about the selected item or items and the bottom part an image or a player able to appropriately display the item or portion of it. If the item is not recognized and cannot be appropriately displayed, the previewer will display the unrecognized content as binary data. Show/Hide example. Zip Jukebox Player The preview player is a great way for you to keep your music and video files in a compact, structured archive. It is easy to use, update, modify and move around. Show/Hide more about Zip Jukebox Player. To make the most of the Zip Jukebox Player, simply create archives containing your audio and video files. For example, after going on a holiday you could create an archive called “Holiday 2012” and place all the videos that you made there in the archive. Then you can play them in sequence or otherwise as shown below. You can do the same for your music files, audio books, download your favorite videos from YouTube to make sure that you always have them, and so forth. It is important that folders with audio and video content do not contain non-playable files (e.g. text documents, etc.) as when the Jukebox player encounters such a file, it will stop and not progress with playing the next file. To start the player, simply set the Preview checkbox and select the first audio or video file that you want to play. Once the player loads the multimedia file, push the start button and then click the context (usually the right) mouse button on the player screen. This makes the Jukebox player appear as a context menu. The various options in the context menu allow you to adjust its behavior and enjoy your music and video from within the archive. It is highly recommended that you always keep a copy of your important information on a secondary drive. It is also not recommended that you allow archives to grow too large. As an archive grows, the probability of encountering drive errors, software errors or other problems that may arise and may cause information loss also increases. The Protected operation mode helps to substantially reduce the probability of such problems occurring, however they cannot be entirely eliminated. Click this menu entry to switch the player to full screen. To switch it back either double click on the screen or use the context menu. Click this entry to toggle between only playing the current file and playing all files in the current folder (and other folders) when the current file finishes. This switch effectively switches the Zip Jukebox player On and Off. Click this entry to toggle between playing the files in the current folder in consecutive order or in a random order. Shuffle only applies to the files within a folder. Click this entry to toggle between only playing the files in the current folder, or continuing with the next folder once all files in the current folder are already played. Click this entry to toggle between replaying all files in the selected folder, or stopping once all files in said folder have been played. If this entry is switched to “On”, the player will loop the files in the same folder or all folders depending on the state of the Play Next Folder entry. Hide more about Zip Jukebox Player. These controls are used to help find items with specific parameters in the archive. Fast Search Query Bar Enter your search query into the Fast Search Query Bar and hit enter to search the currently selected items. Find Queries launched from the Fast Search Query Bar search the selected files and folders using the following settings: Default accept is always True/Yes and Search in nested folders = False/No. For more details on Find in Archive see the explanation in the Find Control section below. Click this button to open the Find in Archive dialog, which gives you full control over the find in archive process. Show/Hide help for Find in Archive. 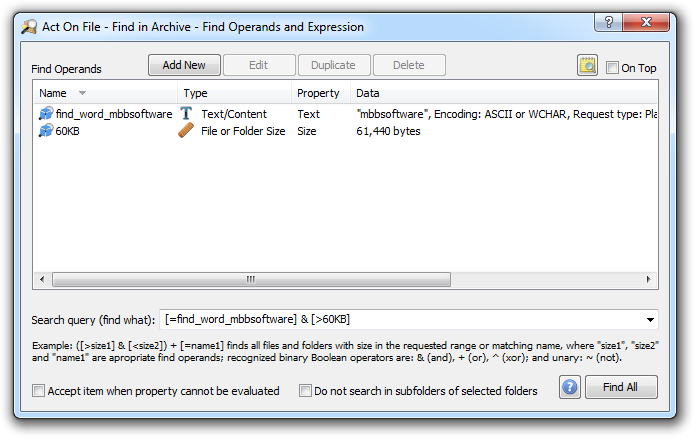 The Find in Archive action uses the same principle of work that the Find Files and Folders functionality of the Locator module employs. In fact, Find in Archive employs the Locator module to perform the search on its behalf. The Find Files and Folders functionality searches for items based on queries which the user creates and submits. The queries are simple expressions of logical operators (such as AND, OR, NOT) and Find Operands. The Find Operands are simple objects which the user creates, remaining until such a time as they are deleted by the user. Each Find Operand represents one particular property that is being searched for. For example, one Find Operand may express file size, while another may express file name, a third one: some text, and so forth. The user combines the find operands that represent the properties that they are searching for using logical operators and thus, the user constructs the search query. Find in Archive dialog which is examined below. Property - depending on the type of the operand, these are the possible searchable properties. For example, if the search type is an image, a searchable property may be width. Data - depending on the type of the operand and the selected property, there may also be a data entry. For example, if the search type is an image and the selected property is width then the data will be a positive number. 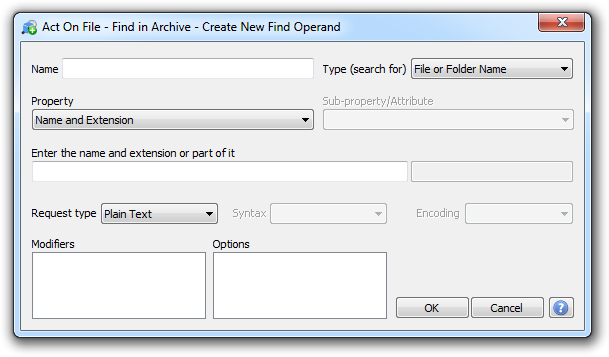 Add New Use this action to create a new Find Operand using the Create New Find Operand dialog. For discussion on the "Create New" and "Edit Find Operand" dialogs, see the Find Files and Folders functionality help article. Edit Select a find operand which you want to amend and use this action to invoke the Edit Find Operand dialog on it. Duplicate Use this action to duplicate a find operand with similar properties to a new find operand that you need, then edit the replica to match your new requirements. Delete Use this action to delete find operands that you no longer need. The action will give you a choice to permanently delete the selected find operands or only remove them temporary from the list to help readability when too many find operands clutter the view. Note that not all relational operators can be used on any Find Operand. The relational operator must be meaningful for the type of the Find Operand applied to it in the Find Unit. For example "<" cannot be used when comparing text, but "=" can be used when searching for text and numeric data. Thus, using find operands with appropriate type and data coupled with relational operators, and joined with logical operators and rounded brackets, one can easily express the simplest to the most complex search query. Accept item when property cannot be evaluated There are cases when properties on a particular file cannot be evaluated for some reason, e.g. because the property is simply missing for that file. Set this checkbox to assume that the property is a match if it cannot be evaluated. Clear this checkbox to ignore items for which a property cannot be evaluated. Do not search in subfolders of selected folders When a search query is started from the Fast Search Query Bar, nested folders are not examined for matches. When a search query is started from the Find in Archive dialog, nested folders are examined for matches by default. Set this checkbox to avoid looking for matches in the nested subfolders of any selected folders. On Top Sets and clears the Always On Top flag of this and its parent Open Archive window. This checkbox adds or removes the window from the group of Top-most windows. Find All Proceed finding all items in the current selection that match the entered search query. Use this button to toggle showing and hiding the Find Results window located in the bottom part of the right pane of the Open Archive window as shown below. Capture: Open Archive with Find Results window. Capture: Find in Archive window and search query for the above results. Hide the help for Find in Archive. Use these menu commands to perform actions on the archive and its folders. The commands may be enabled or disabled depending on the selected item, the type of the archive (e.g. split and spanned archives cannot be modified) or other related properties and conditions. Extract Decompresses the selected folder and its content at a location selected by the user. Export Creates a new archive branch from the selected folder and its content. Same as "Save As" but only applied to the selected folder and its content. Add Files Adds files to the selected folder. Same as the Add Files button above. Add Folders Adds a folder to the selected folder. Same as the Add Folder button above. New Folder Creates a new folder in the selected folder without a description. The description can be added later from the folder properties dialog. Cut Cut the selected folder and its content. You can paste into the archive, which will perform a move operation; or in Windows Explorer, which will extract (decompress) the folder and its content, and delete it in the archive after user confirmation via a confirmation prompt. Copy Copy the selected folder. You can paste into the archive, but since this would duplicate the data in the archive, you will be prompted to accept the move or cancel the operation. When pasted in Windows Explorer, the selected folder and its content will be extracted (decompressed) at the selected location. 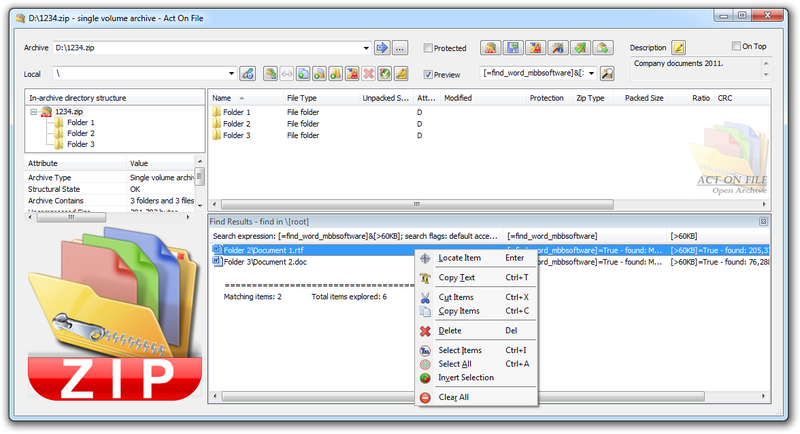 Paste Paste cut or copied files and folders into the selected folder. When the files and folders were Cut/Copied from the archive, they will be moved. When the files and folders were Cut/Copied from Windows Explorer, they will be added to the archive. Encrypt Use this entry to encrypt the selected folder. Same as the Encrypt button above. Rename Initiates the process of changing the name of the selected folder. Delete Use this entry to delete the selected folder and its content. Properties Use this entry to invoke the property dialog on the selected folder. Same as the Properties button above. Refresh Use this entry to refresh the view. Use these menu commands to perform actions on the archive and its files and folders. The commands may be enabled or disabled depending on the selected item(s), the type of the archive (e.g. split and spanned archives cannot be modified) or other related properties and conditions. Extract Decompresses the selected files and folders and their content at a location selected by the user. Export Creates a new archive branch from the selected files and folder and their content. Same as "Save As", but only applied to the selected items. Open with Use these commands to decompress the selected files in a temporary folder and open them for review. The decompressed temporary files will be automatically deleted. Default Application Use this command to open the selected files using the default application registered with the system for this particular file type. Choose Application ... Use this command to invoke the "Open With" system window and select the application with which to open the files for each particular file type. Edit with Use these commands to decompress the selected file in a temporary folder and open it for review and editing. The Open Archive functionality will wait for you to finish the editing. Once you are ready, continue with the Open Archive to update the file in the archive. The temporary file used for your modifications will be deleted automatically. Default Application Edit the selected file using the default application registered with the system for this particular file type. Choose Application ... Use this command to invoke the "Open With" system window and select the application with which to edit the file. Print Use this command to print the selected files using the default applications registered with the system for the particular types of the selected files. Add Files Adds files to the current (selected) folder. Same as the Add Files button above. Add Folders Adds a folder to the current (selected) folder. Same as the Add Folder button above. New Folder Creates a new folder in the current (selected) folder without a description. The description can be added later from the folder properties dialog. Cut Cut the selected items. You can paste into the archive, which will perform a move operation; or in Windows Explorer, which will extract (decompress) the items, and delete them in the archive after user confirmation via a confirmation prompt. Copy Copy the selected items. You can paste into the archive, but since this would duplicate the data in the archive, you will be prompted to accept the move or cancel the operation. When pasted in Windows Explorer, the selected items will be extracted (decompressed) at the paste location. 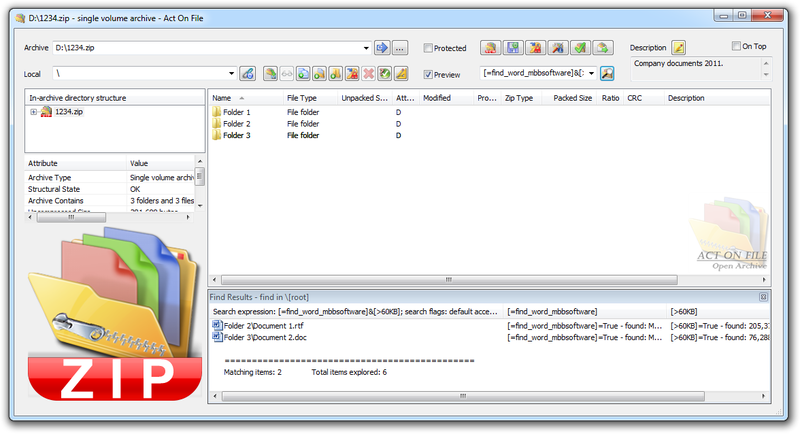 Paste Paste cut or copied files and folders to the current (selected) folder. When the files and folders were Cut/Copied from the archive, they will be moved. When the files and folders were Cut/Copied from Windows Explorer, they will be added to the archive. Encrypt Use this entry to encrypt the selected items. Same as the Encrypt button above. Rename Initiates the process of changing the name of the selected item. Delete Use this entry to delete the selected items. Properties Use this entry to invoke the property dialog on the selected item or a common property dialog (displaying only the common properties) when more than one item is selected. Same as the Properties button above. Use these menu commands to perform actions on the archive and the results from the last find operation. The commands may be enabled or disabled depending on the selected item, the type of the archive (e.g. split and spanned archives cannot be modified) or other related properties and conditions. Locate Item Use this command on a result entry to locate the item in the archive and select it. Copy Text Copy the column containing the items of the selected entries (or all entries when nothing is selected) as text to the clipboard. Cut Items Cut the selected items. You can paste into the archive which will perform a move operation; or in Windows Explorer which will extract (decompress) the items, and delete them in the archive after user confirmation via a confirmation prompt. Copy Items Copy the selected items. You can paste into the archive, but since this would duplicate the data in the archive, you will be prompted to accept the move or cancel the operation. When pasted in Windows Explorer, the selected items will be extracted (decompressed) at the selected location. Delete Use this command to delete the selected items. Select Items Use this command to only select result entries. Empty entries and entries in the Find Result window containing decorative or informative content will not be selected. Select All Use this command to select all entries in the Find Result window. Invert Selection Use this command to deselect the currently selected entries in the Find Result window and select the previously unselected ones. Delete Use this command to empty the Find Results window and its captions.